“Does anyone want to switch seats?” Kris Kristofferson wonders what he’s got himself into. Can Heaven’s Gate ever be rescued from its reputation? For thirty years the film has been marked by the stench of failure, its production having passed into legend alongside Apocalypse Now as an example of how not to make a movie. In the case of Francis Ford Coppola’s film, at least he could cite circumstances beyond his control – a sudden typhoon, Martin Sheen’s heart attack – and the director somehow managed to find a powerful, spectacular film amid the chaos. Heaven’s Gate has no such natural disasters to hide behind and the scathing critical reaction upon its release sealed the film’s fate. This flop wasn’t just viewed as just another bad movie, it was viewed as an example of directorial self-indulgence run amok and the wastefulness of Hollywood studios, and neither United Artists or the film’s young director Michael Cimino (who had reached the peak of his career just two years earlier) ever recovered from the debacle. That was all I knew of Heaven’s Gate before I first saw the film some six years ago, and given its notorious history, I was surprised at how much I enjoyed the experience of watching it. The film has problems, for sure, but it also has considerable virtues and a sense of ambition that is frequently thrilling. Recently watching the film for a second time on the big screen, it seemed inconceivable that this bold and strikingly beautiful film had been described in the press as “an unqualified disaster” (Vincent Canby) and “the most scandalous cinematic waste I have ever seen” (Roger Ebert). Even though this film found a few ardent defenders in those early days – Robin Wood, Kevin Thomas and Nigel Andrews among them – the damage had already been done. As recently as 2008, Joe Queenan (in an article inspired by the release of The Hottie and the Nottie) claimed that Heaven’s Gate was in fact the worst film ever made. Seriously, did we all see the same fim? 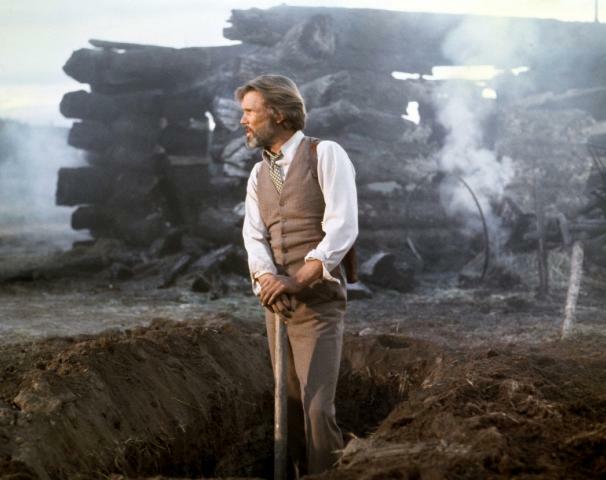 Heaven’s Gate may not be a great film, but it has flashes of greatness within it, and with a little fine-tuning it could have become the masterpiece that its director so clearly envisioned it to be. The story at its centre certainly has the potential to make an exciting and dramatic Western epic, being loosely based on the Johnson County War, an intriguing footnote in the history of the immigrant experience in America. Set in Wyoming in 1890, the plot largely concerns an association of wealthy ranch owners determined to wipe out the growing immigrant population, which it accuses of stealing its livestock. Association head Frank Canton (Sam Waterston) recruits a gang of mercenaries at a rate of $5 per day plus an additional $50 for each of the 125 names on the association’s “death list” that are successfully taken care of. It is a bleak view of life on the American frontier and it should have enough inherent drama and conflict to drive the narrative, but there are undeniable structural flaws in Cimino’s storytelling. In his book Hollywood from Vietnam to Reagan…and Beyond, Robin Wood suggested that Cimino’s storytelling was daringly innovative rather than clumsy, bravely eschewing the conventions of narrative in pursuit of a grand vision. That strikes me as being a little too sympathetic to the director, as the lack of definition in the film’s central characters and their relationships is a serious issue the film struggles to overcome. The film’s main protagonist is James Averill (Kris Kristofferson), a Harvard-educated sheriff who finds himself standing alongside the immigrants as the battle reaches its climax. This is in part because he is involved with one of the women on Canton’s death list, Isabelle Huppert’s brothel madam Ella Watson, although there is also another man in her life in the form of Christopher Walken’s Nate Champion, a violent enforcer for the association. The romantic triangle that exists between these three principal characters is muted and completely lacking the passion required to sell it. The characterisations are sketchy, signified by the manner in which we suddenly learn that Averill and Champion are actually close friends after an hour of the film has elapsed. Too many of these details seem like an afterthought, which is why the film fails almost completely on a human level despite the solid performances from Kristofferson and Huppert (and an extremely good performance from Walken). It’s a strange thing. Cimino drew such tight, focused performances from his ensemble in The Deer Hunter, but with this extraordinary cast at his disposal he often seems unsure of what exactly he’s supposed to do with them. The usually effortless Jeff Bridges seems lost and overawed as he stands behind his bar with foreigners babbling around him, and John Hurt is reduced to lingering in the background of scenes slurring bon mots. It seems pretty clear that Cimino had far more interesting things on his mind than the people involved in his story. In his riveting and hugely entertaining memoir Final Cut, a warts-and-all account of the making of Heaven’s Gate, UA executive Steven Bach recalls Cimino installing an expensive irrigation system under the field that was to be used for the final battle because he wanted to see grass where there was none. “Holy Christ,” Bach protested, “He’s talking about hundreds of people and horses and wagons and explosives. Who the hell is going to see grass?” But such trivial objections didn’t matter to Cimino. He was after a specific vision and he would not stop until he achieved it. You can call that perfectionism or you can call it arrogance, as Cimino continued to throw UA’s money at his epic and to disregard every deadline they set for his production, but the results of his approach are right there on the screen. If there’s one area in which Heaven’s Gate is an unqualified triumph and where it shows some evidence of money spent, it is in its visual spectacle. 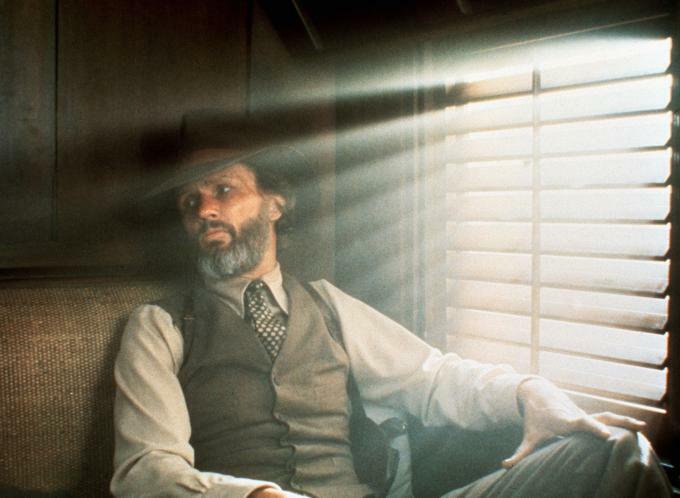 Aside from the prologue (in which Oxford unconvincingly substitutes for Harvard) and the baffling epilogue, Heaven’s Gate stands as an extraordinary evocation of its era. The sense of detail in the film’s art direction (the sole category in which it received an Oscar nomination) is astonishing and Cimino gives us something to look at in every frame, even if he sometimes goes a bit too far (just try to focus on the conversation between Kristofferson and Walken while a juggler inexplicably performs outside the window). Each shot is artfully crafted and Vilmos Zsigmond’s misty, magic hour cinematography shimmers like a half-forgotten memory. Cimino’s direction is more self-conscious then it was in The Deer Hunter (there’s nothing to match the simple resonance of De Niro alone on a mountain peak) but he nonetheless stages a series of virtuoso sequences. The introduction of Walken’s character, silhouetted through a white sheet; the ambush that opens the film’s second half; Nate Champion’s last stand as his cabin burns around him. These scenes and more act as spectacular evidence of Cimino’s ability as a filmmaker, something that’s sometimes forgotten when his excessive behaviour is being mocked. The presence of such thrilling individual moments explains why I am never bored when I watch Heaven’s Gate. Sure, there are numerous scenes that run too long, and the narrative has a chronic lack of focus for much of its opening two hours, but for all of the film’s 220 minutes I’m entranced by its aesthetic splendour and ambitious reach. I’d class it alongside something like Bertolucci’s 1900, another epic film that doesn’t really work if you break it down and analyse each component, but when viewed as a whole on the big screen its impressive individual aspects somehow develop a cumulative force. Perhaps Cimino was simply a victim of poor timing; if Heaven’s Gate had been released five or six years earlier, it may have been viewed as a film symptomatic of the director-led New Hollywood’s adventurous spirit. Instead, it is seen as a disaster that hammered the final nail into that decade of creativity and freedom. This is a simplification of the facts and an unjust stain on the reputation of a film that is long overdue a critical reappraisal. Heaven’s Gate may have failed to meet both its financial and artistic ambitions, but few cinematic failures are as interesting as this. Nate Champion! There’s a name. I saw this twice in the cinema on its initial restored re-release, and sat through the first hour of ‘visionary’ stuff, with its highly unconvincing freshmen (John Hurt didn’t even look young when he actually WAS young) with slight impatience. But the remainder of the film, as Phil says, is full of remarkable stuff. If this is flawed genius, I’d take it over the highly achieved, masterful stupidity of The Deer Hunter any day. Steven Bach’s book is a good book, it’s just a terrible shame that in writing it he buried a really good movie for most of a generation. In fact, when I meet people who go on about Final Cut, I make a point of asking them if they’ve ever watched Heaven’s Gate, and so far none of them have bothered. Easier to sit in judgement, I imagine. A footnote: Cimino spent quite a long time in Ireland prepping a Michael Collins biopic. Good as the Jordan one is, and I think it’s his best film, I’d much rather have seen Cimino’s version.